This is the main program window wich should be opened by default on program startup. Here you need to enter the site, change settings etc. To get the Google Sitemap generated -- just click on the "Google Sitemap" tab. You'll see 2 buttons below the sitemap itself: "Save to File" and "Copy to Clipboard" - use them to store your map in file or just copy the map into the clipboard and paste in your favorite text editor. In case you want to preview/manage the links extracted, click the "Links Manager" button. 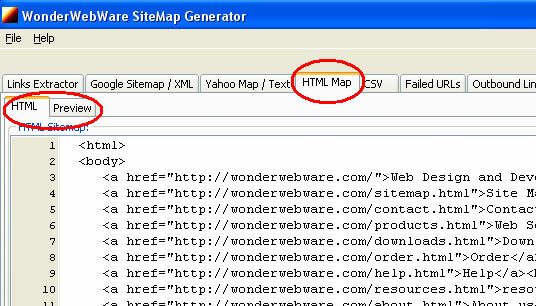 It works in the same way as "Google Sitemap" (explained above)... The difference between Google and Yahoo maps is that Google requires XML formatted map, while Yahoo just asks for a text file with the links. Click "Save to File" to save the text map to a file or "Copy to Clipboard" if you want to paste the sitemap directly to your text editor. Here you can get the HTML version of the site map. In general, Sitemap Generator will use the page title as text for the links and the meta description for short description under the title (will be empty if no meta description tag defined). You can get instant preview of the map by clicking the "Preview" tab. In case you need to import the site map generated into excel or other similar program, you may use the "CSV" version of the map. 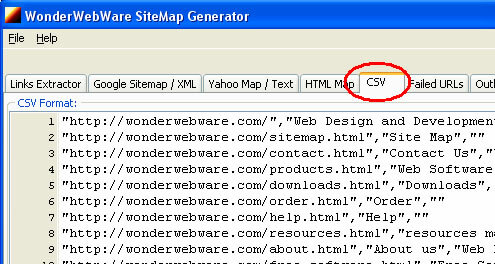 Click the "Failed URLs" tab to see if there are some links that Sitemap Generator cannot process. There are different reasons that may cause some URL to "fail" -- like temporary lost connection to the server, too big target page, unknown file type or not existing page. You may use the "Links Manager" to check these failed URLs and rebuild the map with your changes. In this tab you can review the external links found in your site. "Outbound" link is a link that points to another site. Generally, we do not include these in the sitemaps, so they are here only for reference.